"His ribs are the best I ever had and that ain't no joke! Tender, fall off the bone and melt in your mouth" Greg G.
"So glad I got a rack of Shane Griggs' world famous baby back ribs!!!!!!! 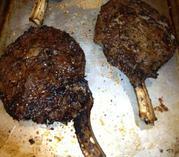 Thank you Shane, it was delicious!!! Serena E.
"Amazing! My boys had the ribs gone in 5 minutes flat! Plus great customer service! 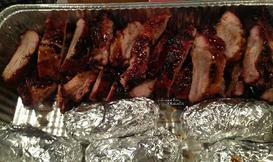 Libby H.
"Amazing amazing amazing ribs and BBQ sauce. So delicious! The perfect dinner for our family!" Rachel C.
Shane spent 15 years honing his skills and growing his passion for bbq working for award winning competitive cooking teams - Texas Longhorn & Maui Wowie BBQ Co. Competing in events like The Horizon, Sacramento's Rythym & Blues and the Best in the West Rib Cookoff, Shane can certainly handle your backyard bbq or your next corporate get together. After returning to his home state of Texas in 2004, Shane continued cooking for friends, family, numerous events for his church and other charities. In 2016, Shane decided to get back to what he loved doing, cooking world class barbecue! COPYRIGHT SHANE GRIGGS ALL RIGHTS RESERVED.